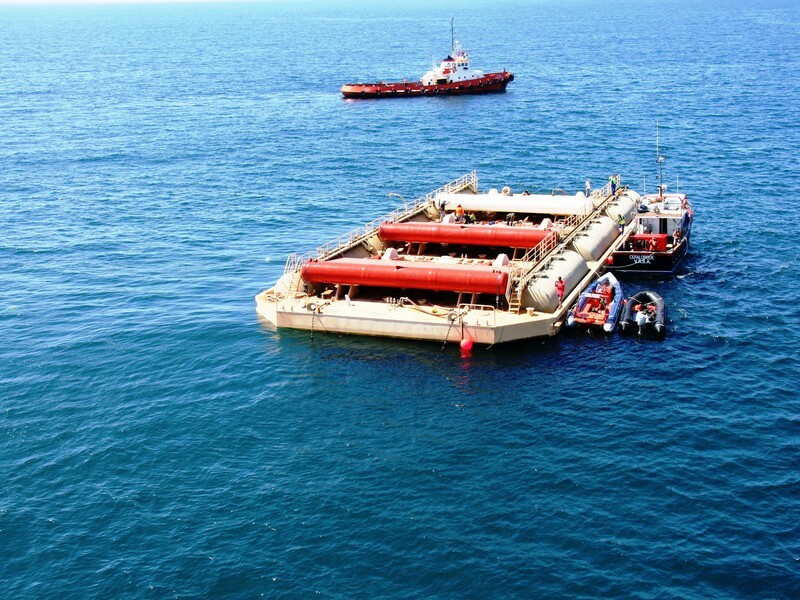 SURGE (Simple Underwater Renewable Generation of Electricity) is a project founded by European Union. It consists of a plate anchored on the sea bottom at its base that moves back and forth with the surge to create a piston pump due to this kinetic energy. The project aims to access the WaveRoller device in a holistic manner and consequently, besides the performance, it includes an environmental program in order to evaluate some of the environmental impacts that it may have. It should be noted that these studies go beyond the legal requirements for the project implementation and they aim to proactively identify, target and address the potential impacts, both positive and negative, derived from the installation of the Waveroller device. Although the project ended in 2013 AW Energy will continue operation in the same site and environmental monitoring programs will go on also until the device has been decommissioned. Located near Peniche, Portugal in the Atlantic Ocean in 8-20 metres depth. In 2011 an environmental incident assessment (also known as Appropriate Assessment) was made for this project because the site is in a Natura 2000 area. According to the Portuguese decree no. 225/2007 an Environmental Appropriate Assessment process has to be carried out for projects located within Natura 2000 sites, National Ecological Reserve sites or National Grid of Protected Areas. The study investigated Waveroller’s possible environmental impacts and suggested mitigation actions. The main outcome was that WaveRoller’s environmental impacts are less significant and they mainly take place in the installation phase. Later in the same year AW Energy obtained environmental license for the project after favorable conditional Environmental Impact Assessment decision (in Portuguese "Decisão de Incidências Ambientais favorável condicionada"). Construction of the devices took place in Finland and Portugal from early 2010 until mid-2012. The initial work was conducted in Finland, while the construction of the floating foundation, composite panels and full assembly of WaveRoller was executed locally in Peniche, Portugal. WaveRoller was installed in August 2012 and has been in operation ever since. The SURGE project ended in October 2013 but the device will continue to be tested in the same site. Environmental monitoring of the SURGE device was finalized in 2014. The Environmental Incidence study was submitted to the regulatory authority, Comissão de Coordenação e Desenvolvimento Regional (CCDR) de Lisboa e Vale do Tejo in May 2011. In August 2011 AW Energy was awarded with environmental license. The license was originally for two years and AW Energy has requested to continue it. The key environmental issues identified are underwater noise generation during operation and alterations on macro benthic communities and sediment movements. All these issues are in the environmental program of the project and they were addressed through monitoring. Also marine mammal monitoring was conducted apart from the program of the SURGE project. Environmental Website: http://aw-energy.com/waveroller/#environment for older data related to the SURGE 1 project. SURGE Waveroller is located in Portugal. Alterations to sediment transport and hydrodynamics. WaveRoller’s interference with broad sediment transport can be neglected. Local and temporary seabed sediments mobilization is possible due to mooring operations. The device doesn’t cause erosion or induce changes in the current regime. Potential impacts to benthic communities. In general it is expected that WaveRoller doesn’t have a negative impact but the possibility of mortality of some fauna exists due to platform settlement on the seabed especially those with less mobility. However there’s no presence of threatened species in the area. Presence of the device can cause a positive artificial reef effect of the submerged device equipment which could provide substratum for fauna aggregation. Potential impact to fish and fisheries. No significant effect is expected. Presence of the device can cause a positive artificial reef effect of the submerged device equipment which could provide substratum for fauna aggregation. Potential impact to marine mammals. No significant effect is expected. AW Energy is currently monitoring WaveRoller’s impact to marine mammals. No impact is expected except in the installation phase an impact is possible due to moving machines and noise. However this impact is considered small because there are lots of substitute habitat areas nearby. Potential environmental impact to other marine users. Proposta de Definição do Âmbito Projecto WaveRoller Peniche made by Tterra – Engenharia e Ambiente Lda, 2011. Environmental characterization of the site. ADCP measurements, side scan sonar and multibeam surveys and sediment samples. The site is mainly sandy with some rocky outcrops nearby. WaveRoller’s impact to benthic habitats. Sediment samples, diver, photo and video surveys. WaveRoller’s impact to marine mammals. Visual observations and acoustic surveys. Seabed at the site was composed by both sandy and rocky substrates. After deployment, results showed similar biodiversity and biomass at the soft substratum level and lower at the rocky substrate level. Rocky outcrops were partially submerged and covered by soft sediment as a result of high hydrodynamic existing in the development area. Therefore, impacts of the deployment are difficult to distinguish. Acoustic underwater noise generated by WaveRoller. Noise emitted by WaveRoller is below the noise emitted by other marine activities (e.g. pile driving, ships and seismic exploration). E,Cruz, T. Simas, E. Kasanen (2015). Discussion of the effects of the underwater noise radiated by a wave energy device – Portugal. EWTEC 2015 Proceedings, Nantes, France.